Are you looking to build a good email list? If yes, you may be worrying about the best email marketing service tool. Exactly! it’s time to throw some light on building the good email list for every online business as it was necessary. Now a day’s increasing the email list is a big deal, and the success rate of the business depends upon the selection of the marketing tools. 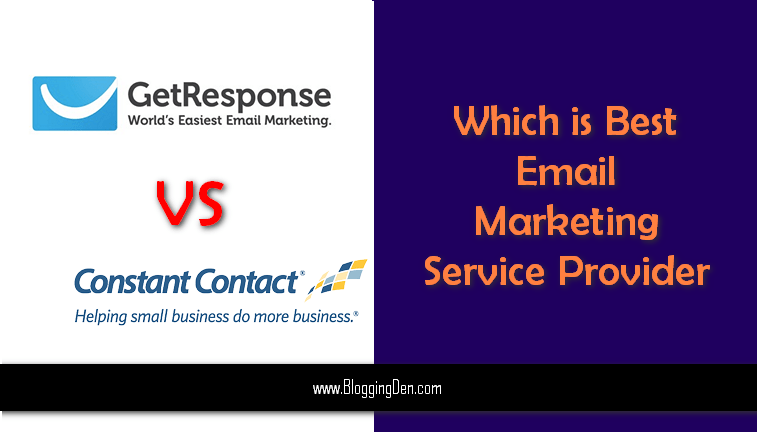 Which is best Email Marketing Service Provider? I just focused on the top 2 email marketing tools and below are the complete reviews about them. It’s time to pick up one to build a powerful email list. Getresponse is an old player of the game but positioned on top by its advanced features. Let’s have a deep view of the features. Email marketing campaign with a beautiful landing page drives your customers easily as they provide enough information about their company and services. This feature is absent in many of the mail marketing tools and its included here. You are allowed to create beautiful landing pages with your own text. You can make your landing page public (i.e. visible to the customers), after creating it. The detailed reports of a landing page that is clicked on the page can be completely viewed. it’s one more advantage to check your customer’s activity. GetResponse Landing Pages boost your sales and clients. Contacts are the essential part of every business to notify the updates frequently. We the people may save our contacts and various forms may be in mail, spreadsheets etc. Some more use the online store managers. It’s completely awkward to manage all the passwords from various places. is not it? Moreover, we may miss many. A bag of tools are included in this feature, and they completely handle the work. They collect the contacts which are in many forms. The best part is Getresponse allows you to upload the contact list if you are changing your marketing tool to some “x” service. Advanced features can’t only make you win the game. Here the design joined the party. The features and all other etc. may be great and excellent, but what next, if their user interface and design are a bit confusing. I am sure you are going to lose the customers with such kind of tools. Let me say about the design of GetResposne. Yeah, it’s completely user-friendly and can be easily navigated to any place with a single click. So, they have the advanced features of the great design, isn’t it more than enough? The answer is yes from my side. There are more than 300+ stylish templates inside the design gallery. Moreover, you can code yourself, to create one unique one. You can create the similar designs too with drag and drop feature. It provides two choices for creating a campaign. You can create your own campaign by using the existed templates, or you can create yourself with a piece of code. You can insert the number of fields as per your requirement(name, email, etc. ).So, the looking of your campaign is up to your creativity and every need is provided to make impressive campaigns. It is included with the best time-based autoresponders to increase its customers, and the complete guides on how to use the GetResponse Autoresponder and they completely explain the features within the auto responding from the root.Moreover, you are allowed to create forms using 150+ free templates for Facebook pages, websites, etc. It looks like regular for the marketers and as a bit high for the beginners. But it’s completely worth to get this kind of services for these plans. Check the plans below. The Getresponse is providing a free 30 days trial. Why wait for a premium version rather than you can try this trial version. Here is the button to do this. Constant Contact is another Email Marketing Service provider. Let’s see the features of Constant Contact, which is having same as above one. Constant Contact is the only one next to Getresponse, which offers the tools to collect the various contacts which are in different forms. The features, working, and tools of import contacts are almost same with Getresponse. Hence, this is going to be a draw between the both services. Let’s move to the next one. Constant contact too provides a lot of features from its design box. You are allowed to browse the templates as per category.Similar to the Getresponse you can add images and text to the landing pages. But the winner is Getresponse as it provides the platform to create own campaign and template which is better than the constant contact. One more thing, the design of Getresponse is slightly better than the Constant Contact. It also offers auto responding as it’s a common feature in all of the email services. But the functionality and tools included in the auto responding are completely different to each other. When it is compared to the Getresponse, It misses some of the advanced features in notifying the customers. Hence, my vote is on the edge of Getresponse. It also supports form builders but somewhat with fewer features. Till now, every feature has same significance and is a bit similar to the Getresponse. But the campaign management which is the most important one is a completely low when compared to the Getresponse. It didn’t meet the common structure of campaign, and it stands as the major drawback of constant contact.It fails in the major part of the tool as it missed many of the advanced features. Pricing plans are a bit reasonable for the beginners. Check out the image below which shows you the complete plans. It offers 60-days free trial. So, finally, our game is going to end by this section. Hope you had come through the features of both the tools. Are you still struggling to make a choice then allow me to suggest you best email marketing tool. I personally vote Getresponse for its every feature. This is one of the best 10 Email Marketing Companies. Its price may be a bit high, but it’s completely worth to pay for its features. Just go with Getresponse and start building mail list without worries. Get 67 Premium themes for $99 for one-year full premium support with lifetime access.